This delicious recipe came from one of our valued customers, Mary, at the New Albany Farmer’s Market. She shared with me that it was actually a recipe she had back in college many years ago. Here it is, although she never made it with fresh basil and oregano she thought it would be awesome. She said it taste even better the next day. I did use the fresh basil, oregano and garlic and thought it was wonderful. Everything she said was true, it was great leftover. I managed to save a slice from Kenny before he ate the whole thing. Sauté zucchini and onion in margarine until tender (approx. 10 minutes) stir in parsley, salt, pepper, garlic powder, dried basil, dried oregano. In large bowl combine eggs with shredded mozzarella. Stir in zucchini mixture. Spray glass pie plate with non-stick cooking spray. Separate crescent rolls into 8 triangles. Press over bottom/up sides to form crust. Brush with mustard. 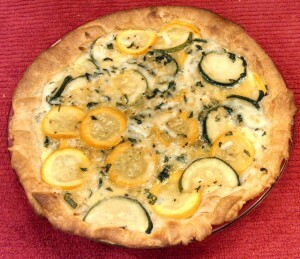 Pour zucchini mixture into crust. Bake at 375 for about 20 minutes or until center is set. Cover crust with foil last 8 minutes. Let stand 10minutes before cutting.